The LDS NVME HOST RECORDER IP has been done for beginners and expert in NVMe to drive NVMe PCIe SSD. * PCIe RP and EP register configuration is done automatically. * NVMe register configuration is done automatically. * Able to manage 8 Name Spaces. * Able to manage until 16 IO Queue to fit specific user requirement. o	Each IO Queue is independent. * Able to manage 512Bytes or 4096Bytes sector size. * Able to run nearly all Admin command in parallel of IO Queue. * Many IO command already pre-defined to ease use of the IP. * Configurable IO Queue buffer size to fit user memory requirement in case of small density FPGA: 32KB, 64KB, 128KB or 256KB. * Able to read all PCIe RP and EP registers. 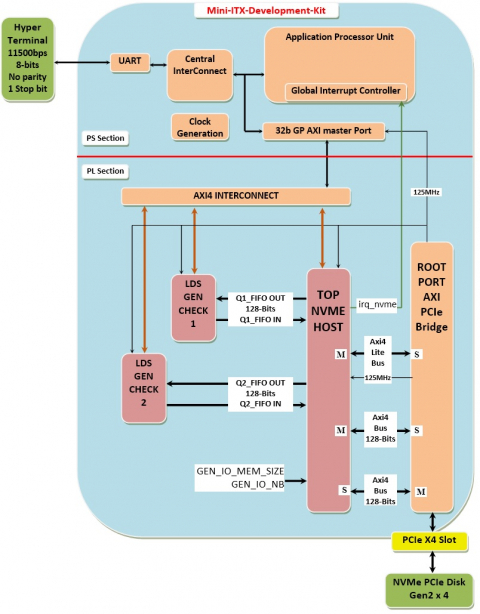 * Easy connection to embedded Root Port PCIe IP through AXI bus. When using a PCIe RP IP configured in Gen2 the system frequency is at 150MHz. When using a PCIe RP IP configured in Gen3 the system frequency is at 250MHz. The source code format is available for ease of customization. The customization can be done by Logic Design Solutions and DO254 documentation is available on request. This IP can be customized according to specific needs (application-specific requirement). Any other pre-designed functions can be integrated into the FPGA. FPGA density and I/O requirements can be defined according to customer specification.